The inside of airplanes seems to be getting smaller and smaller these days. And with that, we seem to be evolving into a never-ending pile of squished human bodies into shrinking seats. Getting comfortable on airplanes seems to have gotten lost, but there are a few tips and tricks up our sleeves that may help you survive the long-haul flights to exciting destinations. Get the right Airline Carrier. 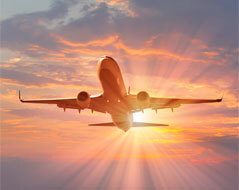 The first thing, before you even step onto the airplane, is to book with the right airline carrier. There are a lot of great airlines out there, but did you know that some airlines build their coach class with smaller seats? If you need space, then make sure you don’t book a flight on a lower cost carrier such as Allegiant, Frontier, and Spirit. Find the right seats. Even once you get on the airplane, your chances of getting a seat with extra room is quite slim (unless you are rolling in the dough and purchase an exit row or first class seat). So what do you do? Avoid the last row at all costs or any other row that you cannot recline your seat. If you were unable to get into first class, talk to the gate agent and ask to upgrade to an exit row seat. Often, you don’t have to pay for this upgrade! Bring home with you. Well, not literally. But bringing a few comfort snacks may help the airline meals seem a little more bearable. If you’re on a plane for the long haul, bring a small, light-weight blanket or pillow to give some padding on the seats, to support your back or neck, and to give warmth when the airplane turns into an ice box. Bring less. On an airplane, bringing less with you can often mean more comfort. You don’t have to worry about carrying a bunch of bags with you. Plus, if you don’t have to put anything under the seat in front of you, it ends up giving you more room to stretch out your legs! Leave the fancy frills at home. Dressing fancy for a night on the town is one thing, but if it’s going to make your flight uncomfortable, then leave your ball gown, tuxes, or classy clothes packed away or left at home. Start thinking breathable clothes, tennis shoes, a sweatshirt or your favorite pair of jeans.